Akkerman The Hague presents a brand new ink collection, dedicated to the great Dutch Masters. We have twelve characteristic colours available, each of which is inspired by paintings of Rembrandt, Hals, Vermeer and other famous Dutch painters. The names of the ink are based on the colour or subject of the paintings. The unique shape of the bottle, with its long neck and marble, originates from the 1930’s. In addition to the long neck, the bottle has a rounded shape and wide, stable base. The new “Dutch Masters” bottle holds more than 120 ml (4.0 oz) and thus contains twice as much ink as the “regular” Akkerman ink bottles. By tilting the closed ink bottle, the neck of the bottle fills itself with ink. When the bottle is put on a flat surface again, the marble will fall back and prevent the ink from flowing back into the bottle. In the neck of the bottle there is now a small reservoir and you can easily fill your fountain pen, even when the pot is almost empty! Special attention has been paid to the packaging. Even though the theme is classical, the box is vibrant and fresh. The “Dutch Master collection” is a must have for everyone who uses a fountain pen, and a unique gift. To mark our 100 years of existence, PW Akkerman introduced in 2010 his own ink line. This ink’s came in large 150 ml bottles, these large bottles are now completely sold out. Due to the worldwide success of this unique bottle we decided to continue, but now with a smaller sized bottle with a content of ca 60 ml. The new bottles will be available in the same 31 colors as before. The Akkerman inks have been given names related to the city The Hague. 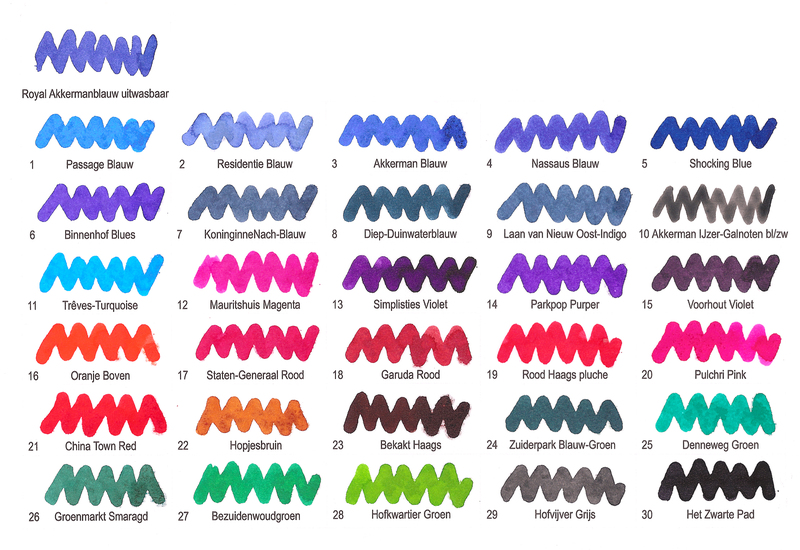 For example: KoninginneNach-Blauw, Binnenhof Blues, Shocking Blue, Parkpop Purper or/and Rood Haags Pluch. The faceted inkbottle is characterized by the long-neck, in which there is a glass marble. When the closed inkbottle is tilt, the neck of the bottle fills itself with ink. Horizontal again the marble will fall back and prevent the ink to flow back into the bottle. In the neck of the bottle there is now a small reservoir and you can easily fill your fountain pen, even when the pot is almost empty! The cost for shipment abroad depends on the country and weight. An indication of the shipping costs appears in your shopping cart when a product is placed in it.Indicative: 5 Akkerman bottles outside Europe, eg to USA Canada Australia Japan China etc. comes at € 20,00 Shipping cost. 6-14 new Akkerman ink bottles costs € 30,00 and 15 up to 30 bottles (max) is € 50,00 shipping. 30 bottles is the maximum number of bottles that we will fit in 1 box.